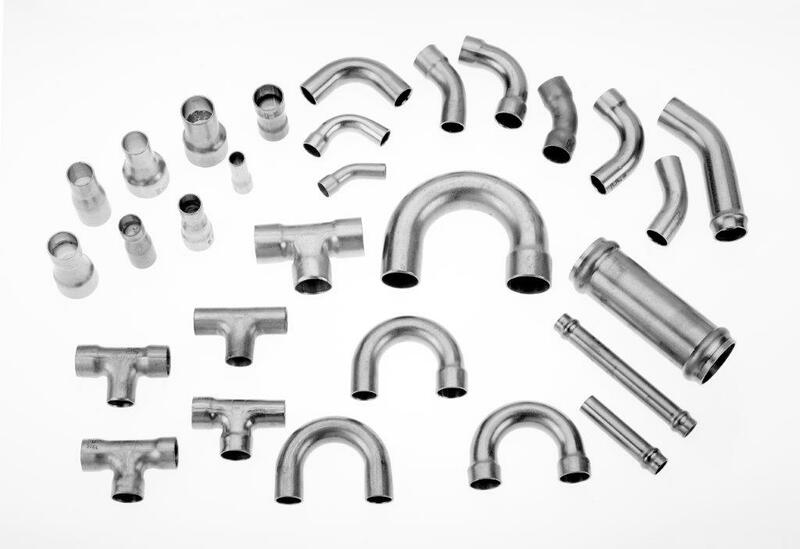 MicroGroup is a leader in the manufacture of tube fittings in stainless steel and nickel-covered brass, and carries a full assortment of fittings that complement All-Tube tubing. These stainless steel tube fittings are fabricated from thin wall tubing in actual tube OD sizes. BrazeTyte and HozeTyte were developed to satisfy the need for a standard line of versatile fittings compatible with thin wall stainless steel tubing and suitable for reliable permanent-type assemblies. Click on the image to view a larger detailed image. Image for reference only and may not reflect actual part appearance. For more specific product information please see out Fittings Page. Buy Today, Ships Next Business Day. 13/16" Cap 0.049 1 1/4"
15/16" Cap 0.049 1 1/2"
15/16" Union 11/16" 0.025 1/4"
1" Union 3/4" 0.025 5/16"
1" Union 3/4" 0.028 3/8"
1 5/32" Union 27/32" 0.032 1/2"
1 11/32" Union 29/32" 0.035 5/8"
1 9/16" Union 1 1/16" 0.042 3/4"
2 1/4" Union 1 1/2" 0.049 1"
2 1/2" Union 0.049 1 1/4"
2 11/16" Union 0.049 1 1/2"
15/16 Reducer 5/16" 0.254 0.025 5/16"X1/4"
7/8" Reducer 3/8" 0.254 0.025 3/8"X1/4"
1 1/32" Reducer 3/8" 0.316 0.025 3/8"X5/16"
1 9/32" Reducer 1/2" 0.379 0.032 1/2"X3/8"
1 3/8" Reducer 5/8" 0.504 0.035 5/8"X1/2"
1 3/8" Reducer 3/4" 0.504 0.035 3/4"X1/2"
1 3/8" Reducer 3/4" 0.629 0.035 3/4"X5/8"
2 7/16" Reducer 1" 0.754 0.049 1"X3/4"
2 7/16" Reducer 1 1/4" 1.005 0.049 1 1/4"X1"
2 1/16" Reducer 1 1/2" 1.005 0.049 1 1/2"X1"
2 3/8" Reducer 1 1/2" 1.225 0.049 1 1/2"X1 1/4"
1 7/16" Transition 0.035 5/8"X3/4"
2 1/2" Transition 0.049 3/4"X1"
2 1/2" Transition 0.049 1"X1 1/4"
2 1/8" Transition 0.049 1"X1 1/2"
2 7/16" Transition 0.049 1 1/4"X1 1/2"
1 1/16" Transition 0.025 5/16"X3/8"
1 5/16" Transition 0.032 3/8"X1/2"
1 7/16" Transition 0.035 1/2"X5/8"
1 7/16" Transition 0.035 1/2"X3/4"
7/8" Reducing Union 0.316 0.254 0.025 5/16"X1/4"
2 7/32" Reducing Union 0.379 0.254 0.025 3/8"X1/4"
1" Reducing Union 0.379 0.316 0.025 3/8"X5/16"
1 1/4" Reducing Union 0.504 0.379 0.032 1/2"X3/8"
1 5/16" Reducing Union 0.629 0.504 0.035 5/8"X1/2"
1 5/16" Reducing Union 0.754 0.504 0.035 3/4"X1/2"
1 5/16" Reducing Union 0.754 0.629 0.035 3/4"X5/8"
2 3/8" Reducing Union 1.005 0.754 0.049 1"X3/4"
2 3/8" Reducing Union 1.255 1.005 0.049 1 1/4"X1"
2" Reducing Union 1.505 1.005 0.049 1 1/2"X1"
2 5/16" Reducing Union 1.505 1.255 0.049 1 1/2"X1 1/4"
13/16" 90 Elbow 3/8" 0.025 1/4"
29/32" 90 Elbow 15/32" 0.025 5/16"
1" 90 Elbow 9/16" 0.028 3/8"
1 1/4" 90 Elbow 3/4" 0.032 1/2"
1 9/16" 90 Elbow 15/16" 0.035 5/8"
1 7/8" 90 Elbow 1 1/8" 0.042 3/4"
2 15/32" 90 Elbow 1 1/2" 0.049 1"
2 15/16" 90 Elbow 1 7/8" 0.049 1 1/4"
3 13/32" 90 Elbow 2 1/4" 0.049 1 1/2"
90 Elbow 3/4" 3/8" 0.025 1/4"
90 Elbow 27/32" 15/32" 0.025 5/16"
90 Elbow 15/16" 9/32" 0.028 3/8"
90 Elbow 1 1/4" 3/4" 0.032 1/2"
90 Elbow 1 1/2" 15/16" 0.035 5/8"
90 Elbow 1 7/8" 1 1/8" 0.042 3/4"
90 Elbow 2 15/32" 1 1/2" 0.049 1"
90 Elbow 2 15/16" 1 7/8" 0.049 1 1/4"
90 Elbow 3 13/32" 2 1/4" 0.049 1 1/2"
13/16" 90 Elbow 3/4" 3/8" 0.025 1/4"
29/32" 90 Elbow 27/32" 15/32" 0.025 5/16"
1" 90 Elbow 15/16" 9/16" 0.028 3/8"
1 1/4" 90 Elbow 1 1/4" 3/4" 0.032 1/2"
1 9/16" 90 Elbow 1 9/16" 15/16" 0.035 5/8"
1 7/8" 90 Elbow 1 7/8" 1 1/8" 0.042 3/4"
2 15/32" 90 Elbow 2 15/32" 1 1/2" 0.049 1"
2 15/16" 90 Elbow 2 15/16" 1 7/8" 0.049 1 1/4"
3 13/32" 90 Elbow 3 13/32" 2 1/4" 0.049 1 1/2"
13/16 180 Return 3/4" 3/8" 0.025 1/4"
29/32 180 Return 15/16" 15/32" 0.025 5/16"
1" 180 Return 1 1/8" 9/16" 0.028 3/8"
1 1/4" 180 Return 1 1/2" 3/4" 0.032 1/2"
1 9/16" 180 Return 1 7/8" 15/16" 0.035 5/8"
1 7/8" 180 Return 2 1/4" 1 1/8" 0.042 3/4"
2 15/32" 180 Return 3" 1 1/2" 0.049 1"
2 15/16" 180 Return 3 3/4" 1 7/8" 0.049 1 1/4"
3 13/32" 180 Return 4 1/2" 2 1/4" 0.049 1 1/2"
13/16" 180 Return 3/4" 3/4" 3/8" 0.025 1/4"
29/32" 180 Return 15/16" 27/23" 15/32" 0.025 5/16"
1" 180 Return 1 1/8" 15/16" 9/16" 0.028 3/8"
1 1/4" 180 Return 1 1/2" 1 1/4" 3/4" 0.032 1/2"
1 9/16" 180 Return 1 7/8" 1 9/16" 15/16" 0.035 5/8"
1 7/8" 180 Return 2 1/4" 1 7/8" 1 1/8" 0.042 3/4"
2 15/32" 180 Return 2 15/32" 3" 1 1/2" 0.049 1"
2 15/16" 180 Return 3 3/4" 2 15/16" 1 7/8" 0.049 1 1/4"
3 13/32" 180 Return 4 1/2" 2 13/32" 2 1/4" 0.049 1 1/2"
180 Return 3/4" 3/4" 3/8" 0.025 1/4"
180 Return 27/32" 15/16" 15/32" 0.025 5/16"
180 Return 15/16" 1 1/8" 9/16" 0.028 3/8"
180 Return 1 1/4" 1 1/2" 3/4" 0.032 1/2"
180 Return 1 9/16" 1 7/8" 15/16" 0.035 5/8"
180 Return 1 7/8" 2 1/4" 1 1/8" 0.042 3/4"
180 Return 2 15/32" 3" 1 1/2" 0.049 1"
180 Return 2 15/16" 3 3/4" 1 7/8" 0.049 1 1/4"
180 Return 2 13/32" 4 1/2" 2 1/4" 0.049 1 1/2"
19/32" 45 Elbow 3/8" 0.025 1/4"
5/8" 45 Elbow 15/32" 0.025 5/16"
21/32" 45 Elbow 9/16" 0.28 3/8"
25/32" 45 Elbow 3/4" 0.032 1/2"
1" 45 Elbow 15/16" 0.035 5/8"
1 7/32" 45 Elbow 1 1/8" 0.042 3/4"
1 19/32" 45 Elbow 1 1/2" 0.049 1"
1 27/32" 45 Elbow 1 7/8" 0.049 1 1/4"
2 1/16" 45 Elbow 2 1/4" 0.049 1 1/2"
45 Elbow 17/32" 3/8" 0.025 1/4"
45 Elbow 9/16" 15/32" 0.025 5/16"
45 Elbow 5/8" 9/16" 0.028 3/8"
45 Elbow 25/32" 3/4" 0.032 1/2"
45 Elbow 1" 1 5/16" 0.035 5/8"
45 Elbow 1 7/32" 1 1/8" 0.042 3/4"
45 Elbow 1 19/32" 1 1/2" 0.049 1"
45 Elbow 1 27/32" 1 7/8" 0.049 1 1/4"
45 Elbow 2 1/16" 2 1/4" 0.049 1 1/2"
19/32" 45 Elbow 17/32" 3/8" 0.025 1/4"
5/8" 45 Elbow 9/16" 15/32" 0.025 5/16"
21/32" 45 Elbow 19/32" 9/16" 0.028 3/8"
25/32" 45 Elbow 25/32" 3/4" 0.032 1/2"
1" 45 Elbow 1" 15/16" 0.035 5/8"
1 7/32" 45 Elbow 1 7/32" 1 1/8" 0.042 3/4"
1 19/32" 45 Elbow 1 19/32" 1 1/2" 0.049 1"
1 27/32" 45 Elbow 1 27/32" 1 7/8" 0.049 1 1/4"
3 5/8" Tee 1 13/16" 0.049 1 1/4"
2 1/16" 45 Elbow 2 1/16" 2 1/4" 0.049 1 1/2"
1 1/8" Tee 17/32" 0.025 5/16"
1 5/16" Tee 5/8" 0.028 3/8"
1 1/4" Tee 11 /16" 0.028 3/8"
1 5/8" Tee 13/16" 0.032 1/2"
2" Tee 1" 0.035 5/8"
2 3/8" Tee 1 3/16" 0.042 3/4"
3 1/4" Tee 1 5/8" 0.049 1"
4 1/8" Tee 2 1/16" 0.049 1 1/2"
1 1/16" Tee 19/32" 0.025 5/16"
1 3/8" Tee 11/16" 0.025 5/16"
1 3/16" Tee 19/32" 0.025 1/4"
1 3/8" Tee 11/16" 0.028 3/8"
1 3/16" Tee 19/32" 0.025 5/16"
15/16" Expander 1/4" 0.316 0.025 1/4"X5/16"
7/8" Expander 1/4" 0.379 0.025 1/4"X3/8"
1 1/32" Expander 5/16" 0.379 0.025 5/16"X3/8"
1 9/32" Expander 3/8" 0.504 0.032 3/8"X1/2"
1 3/8" Expander 1/2" 0.629 0.035 1/2"X5/8"
1 3/8" Expander 1/2" 0.754 0.035 1/2"X3/4"
1 3/8" Expander 5/8" 0.754 0.035 5/8"X3/4"
2 7/16" Expander 3/4" 1.005 0.049 3/4"X1"
2 7/16" Expander 1" 1.255 0.049 1"X1 1/4"
2 1/16" Expander 1" 1.505 0.049 1"X1 1/2"
2 3/8" Expander 1 1/4" 1.505 0.049 1 1/4"X1 1/2"
1 1/32" Adapter 0.025 1/4"
1 1/8" Adapter 0.025 5/16"
1 1/8" Adapter 0.028 3/8"
1 9/32" Adapter 0.032 1/2"
1 15/32" Adapter 0.035 5/8"
1 29/32" Adapter 0.042 3/4"
2 9/16" Adapter 0.049 1"
3 1/32" Adapter 0.049 1 1/4"
3 7/32" Adapter 0.049 1 1/2"